If you'd like to click on the video below while reading this post please do so as the music goes along with the post; I promise it's not any sort of loud head-banging kind of music but is instrumental in nature and is part of the music that is used for a web-comic called Homestuck. "... a catch-all term for several webcomics by Andrew Hussie which are all, as the name suggests, made entirely in Adobe Photoshop and later, Flash. Each of the stories is written in the style of an Interactive Fiction Game, where each panel is accompanied by a text description, and the link to the next panel represents a player's command. Homestuck is the newest story, beginning with a 13-year old protagonist named John Egbert, who's alternately trying to play a reality-altering video game called "Sburb" and struggling mightily against a poorly-designed inventory system. 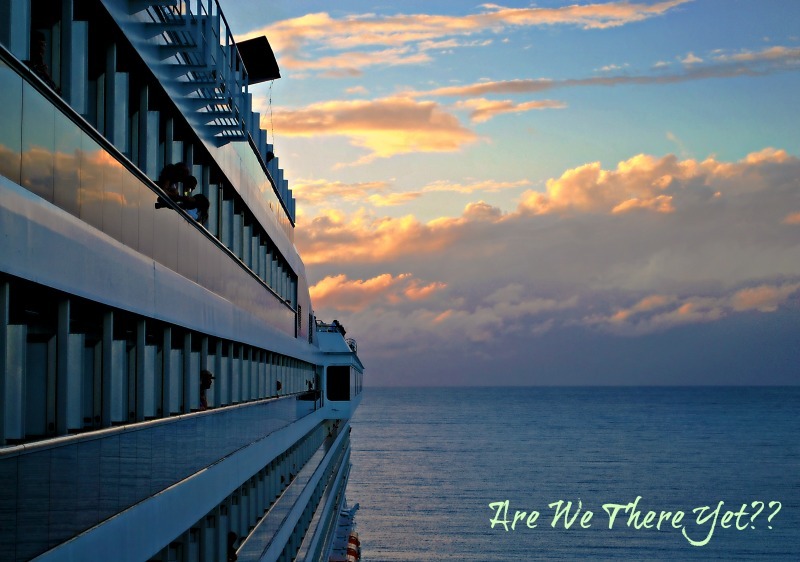 It has since snowballed into an epic of children trying to survive After The End. While still happily displaying the energetic imagination and lightheartedness of Problem Sleuth (Hussie's third series), it has increased focus on deep characterization and dialogue, dramatic moods and a wildly twisting plot. It was initially done entirely in Flash, before Hussie decided to switch back to Photoshop because Flash is a pain to write comics in, though it is still used for some sections, both in interactive mini-games and animations." Everyone who is let's say over the age of 21 who may be lost please raise your hand! You could include me in that group but it's hard to type with one hand in the air so I'll keep my own hand down for now but trust me, I was totally lost when Amanda first started talking about Homestuck and creating troll horns in her spare time! Anyhow, struggling on in a way that I hope readers can understand ... Homestuck's music is associated with and released by a small record label - What Pumpkin - which is made up of a small group of musicians who have created "a large variety of original music and a similarly large variety of remixes based on the various music". The music (which can be found here) is quite good and I even home-shared Amanda's iTunes library and now have almost all of it on my own iPod, including the music above which is part of their newest release, AlterniaBound. So, with all that said you're now probably really wondering what on earth this post is about, right? Some of you may recall that Amanda was home on Spring Break last week and one of her projects that she had in mind to do while she was home was a drawing based on the above music which translated from the Latin means "King of the Twelve". She had it in her head that she wanted to do a drawing in the design of the Bristol Rose Window, a stained glass window which is located in the Cathedral Church of the Holy and Undivided Trinity, a Church of England cathedral in the city of Bristol, England, and commonly known as Bristol Cathedral. The church, originally known as St Augustine's Abbey, was founded in 1140 and became the seat of the bishop and cathedral of the new Diocese of Bristol in 1542. At the western end of the nave at Bristol Cathedral is located their rose window - a generic term applied to a circular window especially used in churches of the Gothic architectural style. The origin of the rose window may be found in the Roman oculus - large circular openings that let in both light and air with the best known being at the top of the dome of the Pantheon. 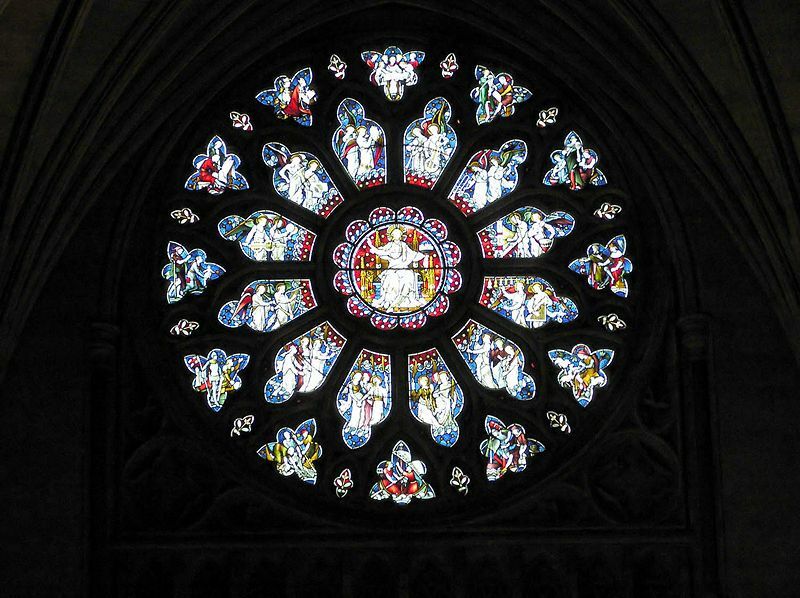 There are nine different styles of rose windows with the Bristol Rose Window being in the Rayonnant Gothic style. 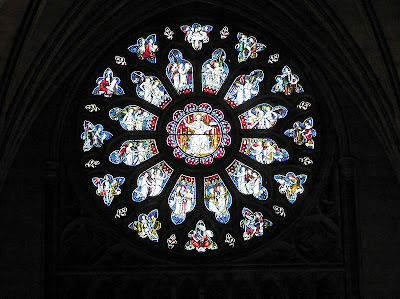 This style of rose window is divided by mullions radiating from a central roundel overlapping in a complex design with each light terminating in a pointed arch and often interspersed with quatrefoils and other such shapes. In addition to the Bristol Cathedral, the north transept at Westminster Abbey has another well-known example. Most, if not all, stained glass rose windows are based on some form of symbolism whether it be the Last Judgement, the Virgin Mary, God's dominion over Heaven and Earth, etc. So, now that you're totally lost in talk of windows and historic cathedrals and all that good stuff - not to mention all the confusing information about Homestuck above! - allow me to show you the completed drawing of Amanda's Homestuck Rose Window which took her just about three days to draw. 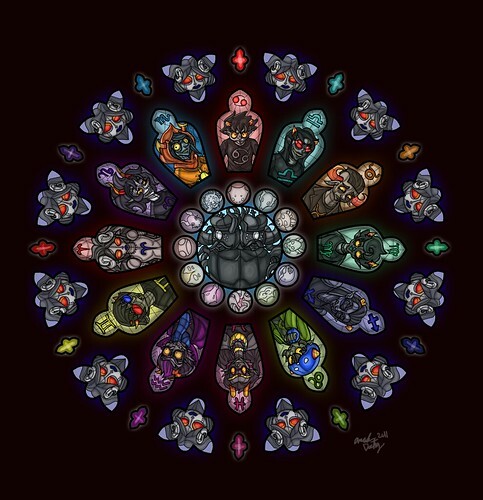 It was the style of the window and the symbolism that she wanted to portray that inspired Amanda to create her own rose window based on the song above, Rex Duodecim Angelus, using Homestuck characters. Please don't ask me who all of the characters are as I honestly don't know but I do know that Amanda did a phenomenal job and I think her final rendering most definitely has a stained glass look about it. Personally I think that Andrew Hussie ought to have his own autographed copy sent to him but Amanda demurred and said that it certainly "wasn't that good". To that I say harrumph and of course it is! I'm going to sound like a bragging parental unit here but honestly? That kid has talent! Not that she got it from me, mind you, but she most definitely has talent! Oh, and if you click on the picture, I think you can get a better look at in a bigger image which makes it even that much more impressive. So ... how do I get Andrew Hussie to read this post?!? If you have a slideshow it's not working for me. As for the photographs...Cool! The whole dystopian trend in literature, comics, music is hard for me to get into but it is definitely one way of coping with the modern world. I don't now anything about Homestuck, but I like the drawing. I think it's quite a clever presentation. I am waaay over the age of 21, so the Homestuck stuff is not my cup of tea. However, I do appreciate Amanda's talent. AWESOME job on the stained glass window rendition!!! Srsly. I have a thing for stained glass windows, and totally appreciate her research, hard work, and time spent in doing this fantastic drawing. I hope she gets the appropriat recognition that she so well deserves. W.O.W. That is a fantastic drawing! All of the thought and thoroughness is amazing. I think back to just a couple of years ago, and the progress is astonishing. I can't think of her doing anything else. Proud mama!!! And I love this post! Your daughter is a genius. I'm an older Homestuck fan and this picture has a LOT of meaning. The song represents the battle between the twelve trolls and the monstrous Black King, depicted in the middle. Throughout the piece we hear themes associated with each of the twelve characters supposedly in the order that they struck the black king. This order can be seen following them around clockwise from the top. There's a lot of other neat little things in there for fans to spot as well. Honestly this might be the best piece of fanart I've seen. For anything.